I was a much more impressive mom before I had my daughter. I’d say things like, “when I have a baby, I’ll do this..” and “when I have a baby, I’ll make that…” Well, most of my grand ideas haven’t been followed through yet and Mia’s 9 1/2 months old. Making baby food instead of feeding her jarred food was one of my ideas. Once the baby came, my list of things to do each day pretty much tripled and I never wanted to go through the trouble of making her baby food. It’s just so much more convenient to buy it at the store. Talk about taking the easy way out. However, I’d still talk about someday “soon” looking up recipes online and finally making it. All bark and no bite. 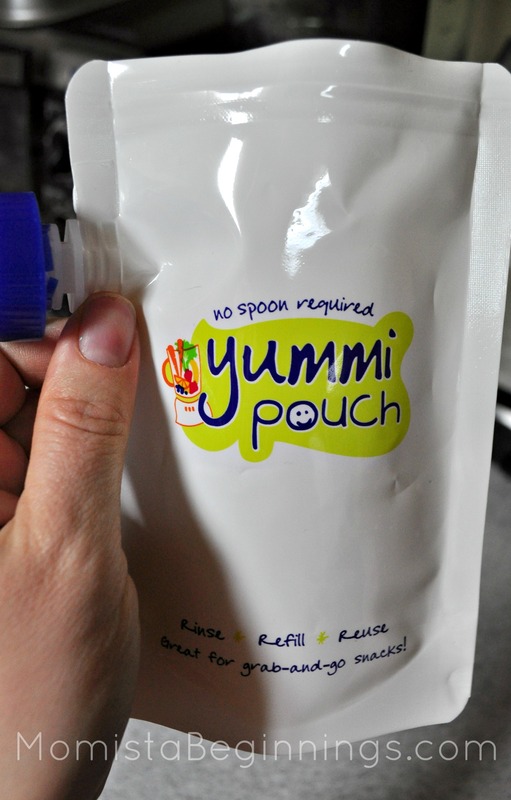 A few weeks ago I was contacted about an opportunity to review a 6-pack of refillable and reusable food pouches called Yummi Pouches. I knew this was the nudge I had been needing to begin making Mia’s food. I didn’t own any kind of baby food storage containers before the pouches arrived so I don’t have any other products to compare them with. We do feed an Organic baby food product that comes in pouches to Mia and she is very intrigued by them. The downer is that we have to throw them away after each feeding and need to continuously buy more. What a waste. The Yummi Pouches are sure to save us some money once I’ve filled them with our own homemade baby recipes. As far as I’m concerned, these pouches are great. Their flexible material makes them convenient to carry around in my purse or in the diaper bag. Mia is a little too…wild, impatient, energetic…to eat straight from the pouch on her own right now (without making a giant mess) but as she grows these pouches will be easy for her little hands to hold and squeeze out the last drop. No spoon required. She’s a do-it-herself kinda gal already so I know these pouches will be super handy for us. They feature a wide and easy-fill opening at the top that has a ziploc type seal and is easy to clean inside. They have a stand-up bottom that props open when filled with up to 6 ounces of pureed grub, each. They’re dishwasher friendly (awesome) and freezer friendly, keeping food cool for up to 2 hours during travel time. Use a dry-erase marker to record the date the food was made AND the contents of each pouch. Clever. So here it goes, my first attempt at making homemade “baby food” for Mia. And yup, I chose pretty much the easiest recipe there is with only 1 ingredient. Yummi Pouch’s website has a RECIPES page worth checking out with more ideas that I’ll be trying, too. Ingredients: 1 apple. That’s it. End result: Success. It would be pretty hard to screw that up. I’ll never buy applesauce again. Into the Yummi Pouch it goes and then into the fridge for later use. If you guys are interested in scoring some Yummi Pouches to try out yourself, or maybe as a gift to someone you know with babies or toddlers… well then you’re in luck. The kind folks at Yummi Pouch are giving one of my readers a free 6-pack! Sweet. 2) Leave me a comment here, on this post, with why you’d like to win AND let me know you’ve “liked” Yummi Pouch on Facebook! *BONUS ENTRY* Anyone who shares their tried and true baby food recipe in their comment scores an extra entry. I’d really love to hear what ya got. This GIVEAWAY will run for 1 week, ending on Friday, February 22nd at 12 am PST. Get your comments in soon and good luck! And please, don’t forget to VOTE for us today (once, daily). Only 2 clicks gets us one step closer to the top of the baby blog rankings. No prize, just publicity. Love the reusable pouches! I almost bought two of them the other day. I’d love to be in control of what in my little ones food. What a fun idea for a give away! I would love to win the Yummi Pouches! I actually liked them on Facebook last week, as soon as I found out about them. I have never really used a baby food recipe, I just steam a lot of vegetables and put them through the blender. Sometimes I pair some of them up when I blend them, or put fruits in with them. Love to hear about new products. As a soon to be mommy, I’m on the lookout for great ideas and ways for my little man to eat healthy! Yummi pouches is intruiging! I give Jax the store bought pouches all the time. It’s how he gets a lot of his fruits and veggie. 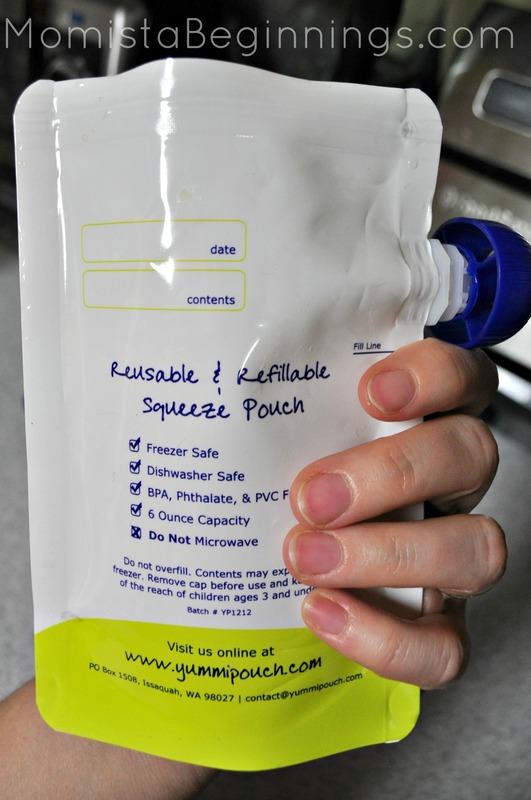 It would be awesome to have the reusable pouches to make our own! I really wanted to make Jax’s food when he was younger too but it was just easier to give him the jarred food. Now that he’s a toddler he can be picky with what he eats and it’s hard sometimes to get him to eat veggies and some fruits. So, I boil and puree things together like sweet potato and carrots which I can mix into mac n cheese or broccoli and spinach together that can be mixed into meatloaf or even spaghetti sauce. We would love to have more pouches because you can never have too many! I have made my own baby food for two kids and basically the same method as you described works for most fruits and veges–and if you need it thinner you add water. I have the best eaters and I think it’s from hardly using jarred food…prunes I buy, though. ;) I liked the FB page!! Thnx!